"A Dark Knight: Mandatory Brunch Meeting"
Another good cold open this week, thanks in large part to Maja Vrvilo’s direction, which is phenomenal throughout this episode. The camera tracks Bruce down the hallway, immediately placing us in the action of Bruce looking for Jerome. He doesn’t find him though, instead coming face-to-face with a school administrator who’s been hypnotized by Tetch. It isn’t long before that man blows himself up in an attempt to kill Bruce, and an arriving Bullock and Gordon. After doing some digging, Gordon and Bullock find out that Jerome is looking for “Xander Wilde.” The only problem? Nobody’s heard of him. He has no address, license, or anything else, which means the GCPD is powerless to protect him. All they know is that he’s a structural engineer, along with the company he works for. Jerome knows that too, and he gets a little bit of information after crashing a board meeting with a shotgun and a few threats. Xander’s never been in the office before, instead giving his instructions to a proxy. 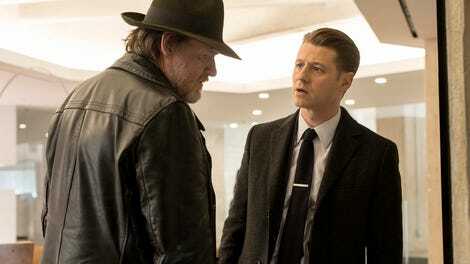 Sometimes Gotham is incredibly overstuffed, but this episode is structured in a way that makes the storytelling clear, and it’s a revelation when stacked next to the last few weeks of episodes. I’ll always miss Barbara when she’s absent, but sometimes that’s the trade you have to make for a little storytelling clarity! Jerome doesn’t get what he wants from the proxy, who ends up knocking him out and transporting him to a cell in Xander’s home. “I used to be a great whistler.” Jerome with the self-depricating humor. 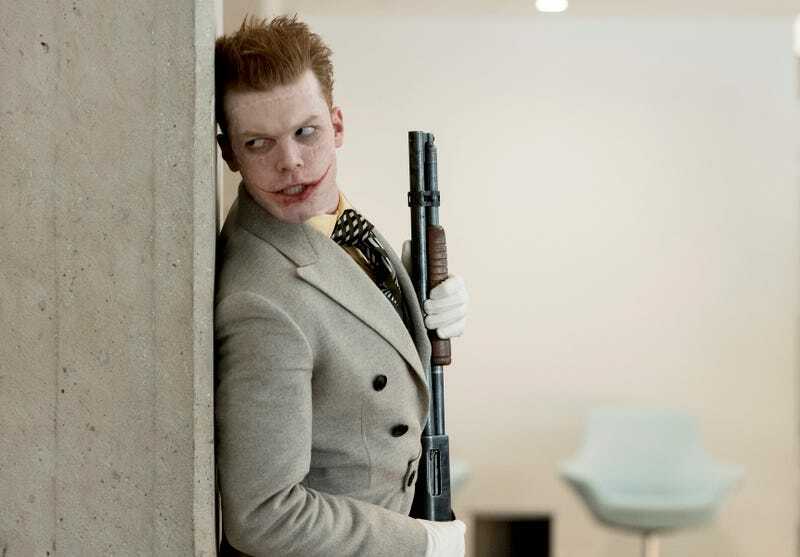 The scene where Jerome storms the engineering company is so strange because it’s daytime and the building is so bright, which never happens on Gotham. This week’s other relevant story sees Lee Thompkins doing everything she can to bring Ed back from The Riddler. She confronts him at his club The Riddle Factory, and challenges him to the game he never loses. Of course, he loses this time around when Lee tricks him into having to say “I love you.” Ed is still in there, and he’s madly in love with Thompkins, especially after a steamy smooch near the end of the episode. So, Xander isn’t “Xander.” He’s Jeremiah, Jerome’s twin, which gives Cameron Monaghan a wonderful opportunity to play opposite himself. It feels pretty tired to shower praise on a Joker performance these days, but Monaghan’s turn drastically changes the energy of the show every time he’s in an episode. The only member of the main cast that does that is Robin Lord Taylor. Bullock’s new strategy for not getting hypnotized by Tetch? Running at him and screaming really loudly. “That’s one way to do it,” deadpans Gordon. Penguin believes he has a fix for Butch: a barrel of toxic waste from Indian Hill. They just need to find Hugo Strange to make it happen. Jerome’s plan for “painting the town crazy” is initially a mystery. By the end of the episode, it’s revealed that Crane’s developed a gas that leaves its victims continuously laughing, possibly until they tear their faces apart. It’s good to have a little clarification about the villains’ plan before the last few episodes of the season. It’s time to add some clear stakes.